Chocolate Peanut Butter Chia Pudding is the ultimate healthy treat! It’s a great source of fibre, calcium and healthy fats, and when it’s topped with chia jam, caramelized bananas and granola, it’s sure to satisfy your sweet tooth! It’s finally April and spring is in the air. Okay, it might be a bit premature to say that since it snowed last night. But we’ve been having some sunny days and warmer temperatures, so I’m declaring it spring! So with that declaration, you’d think I’d be sharing recipes for green salads, asparagus and lemon dishes, all the things that conjure up images of spring. Those recipes are definitely coming, but since the other day was National Peanut Butter and Jelly Day (I know, there is truly a day for everything! 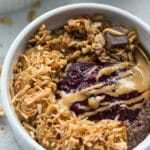 ), I was inspired to share this recipe for Chocolate Peanut Butter Chia Pudding. 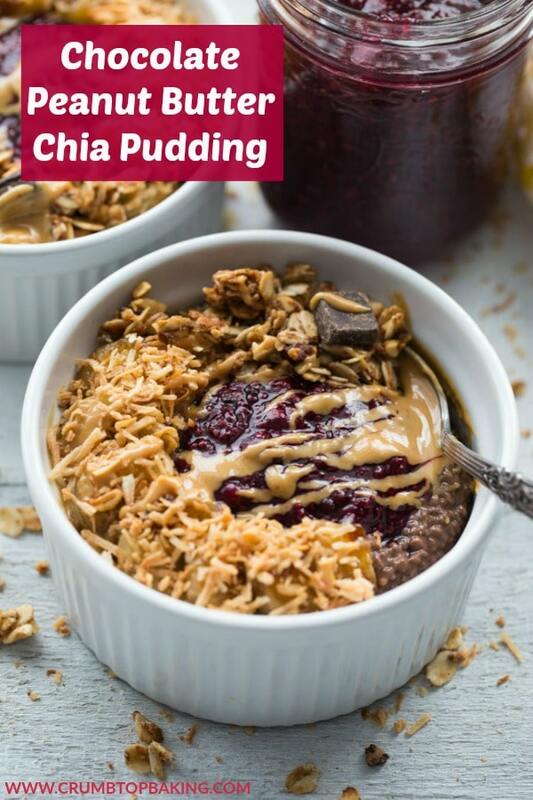 I started eating chia pudding a few years ago when I was looking for something a little different to eat in the mornings that would fill me up but wasn’t the usual toast, smoothie or oatmeal bowl. And chia happens to be a superfood that’s filling and works well in so many recipes. Why is chia so good for you? Chia seeds are dense with nutrients, which means a little goes a long way. They’re a great source of vitamins and minerals, like calcium and iron, and they’re also high in fibre, protein and omega-3 fatty acids. For instance, a 30 gram serving (3 tbsp) has 11 grams of fibre and 6 grams of omega-3 fatty acids. So these little seeds pack a nutritional punch! A general rule of thumb is that for every 1 cup of liquid, you add about 1/4 – 1/3 cup of chia seeds. I like my chia pudding thick, so I usually go with 1/3 cup. I normally use almond milk, but you can also use cow’s milk, coconut milk or cashew milk. For taste, I like to add maple syrup or honey, or you can even add some puréed fruit. For this Chocolate Peanut Butter Chia Pudding, I added maple syrup, cocoa and peanut butter. 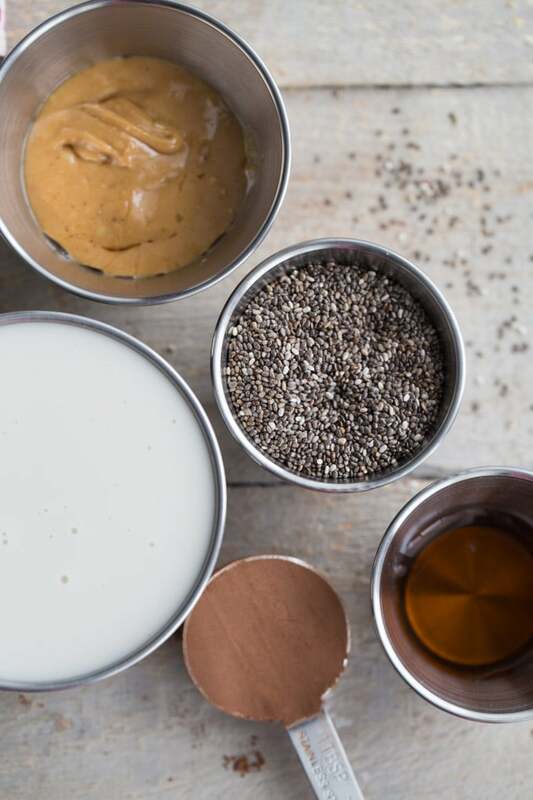 Once, you’ve settled on your ingredients, just whisk it all together and refrigerate for a few hours until the chia seeds have plumped and absorbed the liquid. If you don’t like the texture of the chia seeds, you can blend all the ingredients in your blender, which grinds up the chia seeds a bit. The result will be a pudding with a finer texture. 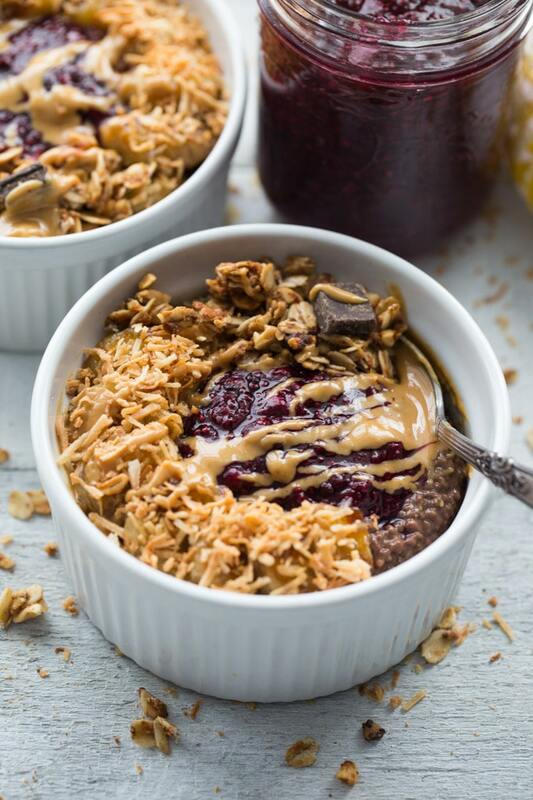 This Chocolate Peanut Butter Chia Pudding is best enjoyed with many, many toppings! Triple Berry Chia Jam is a must! Any kind of jam that is refined sugar-free will work. I just always have a jar of this triple berry goodness stored in the fridge. The tart taste of the berries pairs well with the cocoa and peanut buttery pudding. Since I’m also a huge fan of banana with peanut butter, I usually add a few banana slices to this pudding. And, if I have time, I caramelize the bananas with a bit of coconut sugar. So good! Shredded coconut is also a great topping, and if it’s toasted coconut, all the better. I love to sprinkle on a bit of granola. I usually have some Dark Chocolate Peanut Butter Granola on hand, but any kind will work. We’re just looking for that crunch factor here, so even if you wanted to add some chopped nuts or seeds, that would work too. Lastly, and this is totally optional, but if I’m feeling decadent, I usually melt a bit of peanut butter to drizzle on top. Honey would be awesome too! 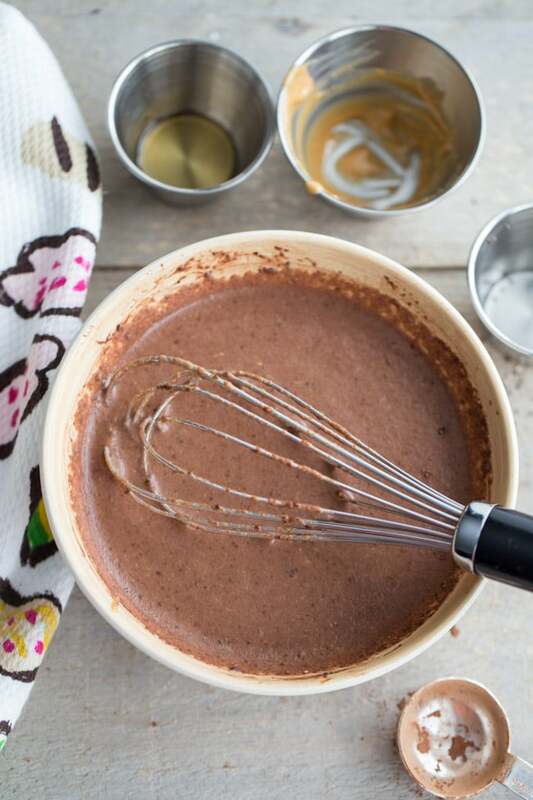 Making the pudding: Add all the ingredients to a bowl and whisk until combined. Cover and refrigerate for 3-4 hours, or overnight, until the chia seeds have plumped and the pudding has thickened. The pudding will keep in the fridge for 2-3 days. Assembling the pudding: Divide the pudding into 2 dishes, and top with desired toppings. Enjoy! Using 1/3 cup of chia seeds will create a thick pudding. If you don’t like your pudding thick, just reduce the amount of chia seeds. If you don’t have salted peanut butter, you can use smooth natural peanut butter and add a pinch of salt to the pudding. To make the triple berry chia jam, add 1 cup each of blueberries, strawberries, and blackberries (fresh or frozen) and 1 tbsp. of maple syrup to a small sauce pan. Cover and bring to a low boil. Simmer until the fruit has softened. Mash the berries and stir in 4-6 tbsp. chia seeds (depending on desired thickness of jam). Remove from heat and let sit for 20 minutes covered. Store in the fridge and enjoy within 2 weeks. 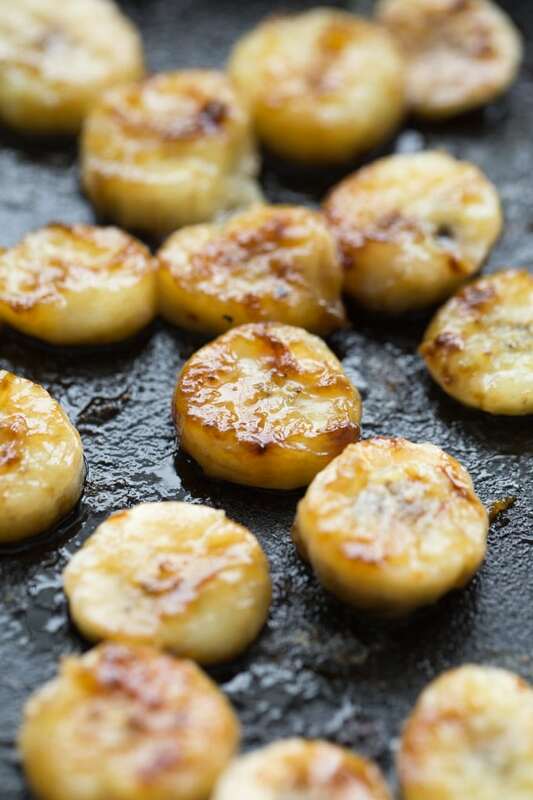 To caramelize the banana, slice one medium-sized banana and spread the slices out on a pre-heated, greased frying pan. Sprinkle on 1/2 tsp coconut sugar. Sauté the banana slices for 3-4 minutes, turning over at the mid-way point. The banana slices are done when they are slightly softened and the coconut sugar has melted. I avoid using a banana that is overly ripe as it will be too sweet and mushy when caramelized. This pudding sounds so easy Leanne. And what a perfect little sweet, yet healthy treat! Thanks Mary Ann! Yes, I love my easy-to-make sweet treats. And this one is healthy enough to double as breakfast! Yay! Hi Puja! I hope you like this pudding as much as I do! Thanks for pinning! Chia pudding for the win…especially if it’s chocolate pb! I can’t believe that after a few decent days of weather here we are with snow and freezing rain (with more potentially on the way). Oh well, guess we will have to enjoy spring through spring inspired recipes 😉 This looks delicious, Leanne! I’m thinking this would be lovely for my 3pm snack! Thanks Dawn! The weather around here is definitely up and down, but I’m hopeful true spring weather is around the corner! In the meantime, I like your idea of this pudding as an afternoon snack. I usually can’t wait that long, so I eat it for breakfast or as a mid-morning snack! It’s nice to see chocolate and peanut butter here instead of green spring food….we all need some variety! 🙂 I love chia pudding and this looks like the most delicious one ever. I can’t wait to try it! Thanks Marcie! I love my greens, but yes, variety is definitely important! Hope you get a chance to try this one. Would love to know what you think of all the toppings! Thanks Ashika! I love a healthy, delicious treat, and you can’t beat a chia pudding for that. I hope you get a chance to make the recipe! Be sure to let me know what you think if you do. Happy weekend to you too! I have all the ingredients on hand so I think I’m making this for dinner :). It’s healthy so that’s allowed right? I looove chia pudding; add peanut butter and chocolate and this is pretty much all I need to eat for the rest of my life. PS, hope your weather warms up soon! Thanks Kelsie! I think spring is on the way for sure. We just need patience around here! As for chia pudding for supper, I think it’s a great idea. And I could totally eat chocolate and PB every day! Have a great weekend! I tried a chia pudding first time ever only a year ago, so I’m not that familiar with it yet. I needed some time to get used to its texture, but I kind of like it now. 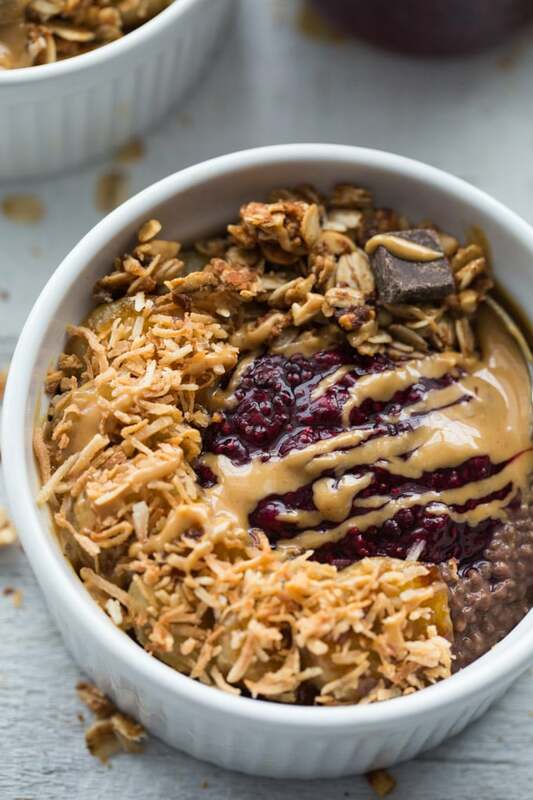 And this chia pudding with peanut butter, cocoa, and lots of delish toppings – you’ve elevated it to a special level! Thanks Ben! The texture of chia pudding does take some getting used to. First when I started making them I would blend everything in the blender, so the texture was more manageable. But now, of course, I love it and the texture doesn’t bother me. Glad you like all the toppings. Happy weekend! This looks so amazing, Leanne! I love caramelized bananas too, and they would be just perfect with this! Thank you for bringing us all of these healthy and delicious recipes!! You’re killing it! Thanks so much Katherine! I’m glad I mostly focus on healthy recipes, because I end up eating most of the food! I only recently started caramelizing bananas, and it has been a game changer! Hope you have a lovely weekend! Thanks Albert! There seems to be a day for everything! I’m big on toppings, if you couldn’t tell! 😉 And the caramelized banana slices go really well with the chocolate and peanut butter. You always have the most amazing breakfast ideas! Then you add peanut butter to make t even better! I keep thinking I need to eat more chia. This recipe is one I must try! I love the general instructions you’ve included, too! Thanks Cathy! I hope you get a chance to make it! I try to add chia to at least one meal or snack each day. I’m glad you appreciate the general instructions. 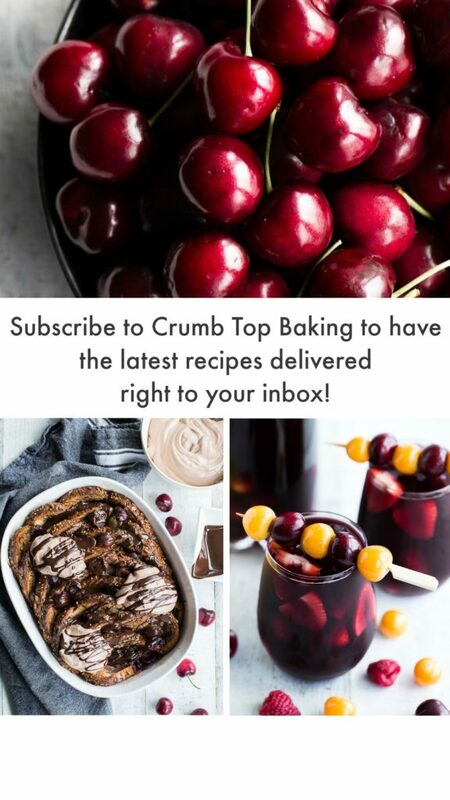 This is definitely a customizable recipe! Oh heck yes please! I’m much more for savory things, but when PB is brought into the equation, I’m in. I guess technically it is savory — and oh-so-delicious when mixed with sweet! It really just amplifies everything. I totally agree Dana! PB is definitely on the savoury side but I think it’s always meant to be paired with something sweet! ;) Have a great week! Oh my goodness, I’m loving what I see! So simple, nutritious and also incredibly delicious! I really like how the chia seeds plump up! I’d love that bowl in front of me right now. It has all of my favorites! Thanks Nicoletta! This bowl has all my favourites too! And it’s so simple to make! I usually make some on Sunday to have as a quick breakfast or snack during the week! I would eat this pudding for breakfast, a pre-snack (that’s a thing, right? ), a snack, lunch, after lunch snack, pre-dinner snack, and dinner. Well, maybe not dinner, but all the other categories are faur game. I’m a HUGE fan of caramelized bananas so the moment I saw you added those I knew I was going to pin the crap out of this post! Thanks Christina. It’s a pretty versatile pudding, so you could definitely enjoy it for all of the above! 😉 Glad I’m not alone in my love for caramelized bananas. They definitely add a little something special to this pudding! Have a great week! I absolutely love chocolate peanut butter chia pudding. And this recipe looks so good, can’t wait to dig in! Thanks Jen! Yes, I know you share my love for all things peanut butter! 😉 Chia pudding is definitely worth a try. It’s such a quick and easy snack. Hope you get a chance to make it! Happy Monday! This recipe looks delicious Leanne! I’ll definitely be trying it out as a part of my weekly meal plan! Yay! Thanks Tanya! Let me know what you think! This is the perfect indulgence! And I love that there are no regrets! YUM! Thanks Annie! Definitely no regrets with this chia pudding! Thanks Kim! Chocolate and peanut butter is definitely my favourite flavour in a chia pudding! Thanks Heather! Yes, I was a little weary of chia pudding at first, but it’s such a delicious and healthy snack, I eat it on a regular basis now! And the caramelized bananas are a great topping too! I like chia, this will make a great recipe for a morning treat for me and my girlfriend — thanks! Thanks Codrut! Chia pudding is definitely a good choice for breakfast!